All prices are in Canadian dollars. We use the total number purchased (ELM626P + ELM626SM) for the calculation. 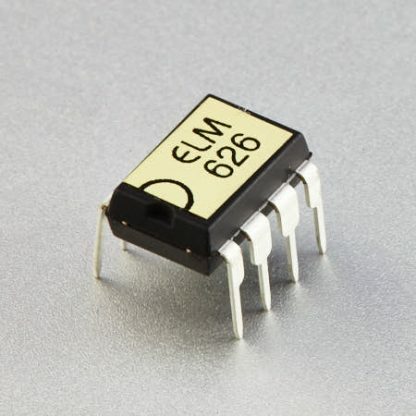 The ELM626 is a complete circuit for detecting break signals on RS232 lines, in an 8 pin package. The circuit is similar to the ELM627 except that an output pulse is not generated on power-up. The threshold for break signal detection is user selectable, allowing the circuit to respond to a transmitted null character, <ctrl>@, at various baud rates. This provides a convenient means for the remote triggering of this circuit by simply shifting to a lower baud rate and sending a null byte. Two complementary high current outputs are provided by the ELM626, so that further buffering is not usually required. The output signal can be selected to be either a continuous one (following the TxD input line) or else a 100ms pulse output. No external components are required for circuit operation other than possibly a current limiting resistor, as all timing references are generated internally.